Liminality. We often seem to be in a liminal state, neither here nor there. We exist in a form of limbo – at least according to ourselves. We’re either not doing enough or we’re doing too much; the balance required to exist in a state of contentment can be seemingly impossible to find. I feel as if I’ll never completely reach that point, the one where I’ll burn bright enough to be a roman candle, but at this point in life that’s okay. It gives me a goal to work towards. 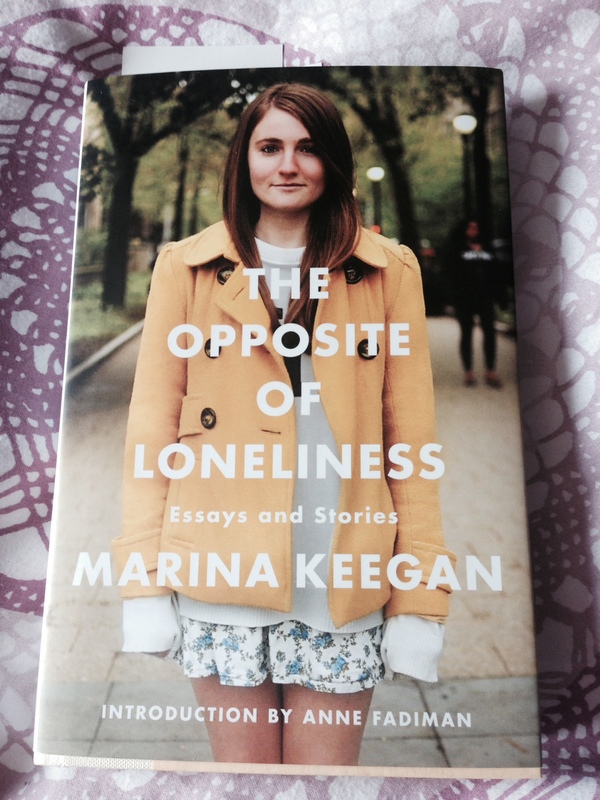 In fact, The Opposite of Loneliness is the title of her first and last book which appeared on shelves this year. I now own that book. I didn’t expect to, but I’ve found that when I need people most they find a way into my life. I needed Marina’s message. We all do, and that’s why I disagree with the HuffPost, she could not have ‘become’ the voice of our generation – she is a voice of our generation. In her words she lives on. Though I am not yet finished the book, I want to take my time and savour it, I would highly recommend it to every student and professor I know. It should be read widely, by all, because it’s a universal coming of age tale, and it’s reality, which makes it better and harsher at the same time. The cold bite of grief that leaves your skin tingling with ice and fear comes from novels like this, but so does the soft, warm feeling of kindness that speaks of security in one’s own mind. Finishing just the introduction brought tears to my eyes, but I did not shed them, though I might by the time I turn the last page. I reacted strongly to the words printed on the pages because I can see Marina, clear as day; in my friends, my teachers, myself – everywhere. All of that can vanish in an instant and I know this, everyone does; it’s constantly drilled into us like a screw being twisted slowly into our hearts, that everything will one day end. We will all be forgotten. Everything will change, has changed and will never be the same again. They’re wrong though, they always have been. It’s that change that makes us appreciate life, the little moments, the big events – that state of liminality isn’t meant to be a curse but a blessing. Never truly ending or beginning, we simply exist and are entrusted with as much time as we are given. We never know how much time that will be so we make decisions, snap choices, long range plans and everything else in between in an attempt to capture every minute of life before it’s gone. It’s especially troubling for my fellows, youth is a beautiful, torrid and tragic love affair with life. I came across the line of advice below while reading a passage in my book of 100 Favourite Bible Verses. It’s short, to the point and accurate, sharp too, in my opinion. We students, are caught between childhood and adulthood with no real place to turn for comfort. We either act too old, too young or just throw up our hands and try to forget our liminality. Work is a mark of adulthood to me, not responsibility, but clocking in and getting a job done. I recently received my first pay cheque for a writing gig I did, and it feels good to be a ‘real writer.’ But what was stopping me from identify as a writer beforehand – nothing, yet there was always something. There probably still is, because how do you know when you’ve ‘made it,’ when have you reached that plateau that means you’ve fulfilled your potential? Still, I want to make something of me; I want to make a difference. I’m just not sure how to do that yet. Neither was Marina though, but she wrote, she was stalwart in her ambition to change things – she tried. She inspires me. And maybe, that’s what it’s all about – not everyone can be a firefly, providing their own light, most of us are candles, reliant upon others to share their flames. One flame might flicker, another may burn quickly, some might even melt the wax from both ends but together we provide the world with hope and light. Be it for a day, a month, thirty years or ten minutes – we are candles. That’s how we make something of ourselves, we accept the fact that life is hard, that people leave and grow apart while we might yearn for everything to stay the same, friends might become foes and vice versa, families might crack, but through it all we are learning, changing and evolving. We are making something of ourselves with every breath we take, every key stroke and every smile. You have made it – you will continue to make it; that, I truly believe. The song is “Giant Sleeps” and is sung by Ryan MacDonald who sings in the Canadian Indie Rock group RM & The Honest Heart Collective. I strongly recommend their music, it helped see me through this past year of university.